TIOGA TRADING AND SERVICES S.L. YOUR NUTS RELIABLE PARTNER. Assisting our custumers in their needs for edible nuts at the right time at the right price. Mediterranean organic almonds: almonds the way they mean to be. 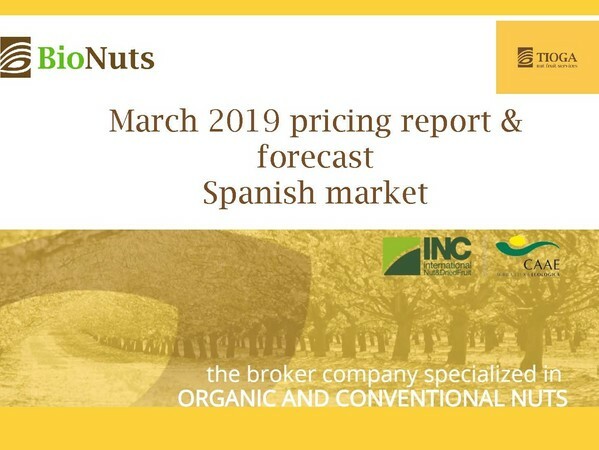 This present report belongs to March Spanish market evolution, pricing evolution during passed March, pricing evolution year to date, Official 2018 Spanish almond surface, frost damage in production areas and organic forecast. 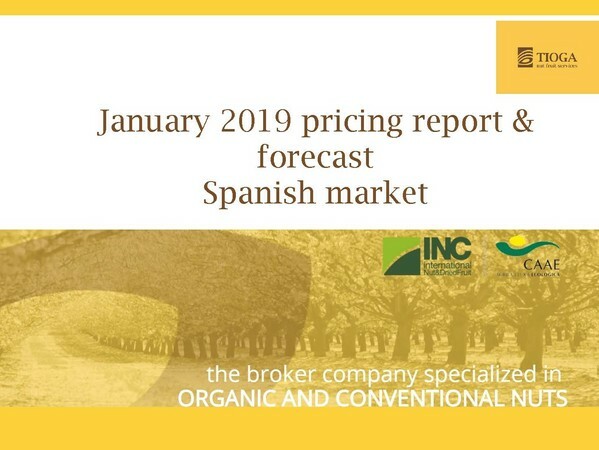 This present report belongs to January Spanish market evolution, pricing evolution during passed January, Official 2018 Spanish crop production and the development in blooming season for 2019 crop. This present report belongs to December Spanish market evolution, pricing evolution during passed December, pricing evolution year to date. This present report belongs to November Spanish market evolution, pricing evolution during passed November, pricing evolution year to date, actual situation for 2018 crop. This present report belongs to October Spanish market evolution, pricing evolution during passed October pricing evolution year to date, actual situation for 2018 crop. This present report belongs to September Spanish market evolution, pricing evolution during passed September, pricing evolution year to date, actual situation for 2018 crop.